Samuel Brody and Justine Bohl try to create a capsid by fitting together 3D model pieces that represent subunits of protein. When the science journal Nature published a controversial article in 2012 about the bird flu virus, the media picked up on the debate among scientists. The publication of the article had been delayed for six months by the National Science Advisory Board for Biosecurity, which feared the findings could be used by bioterrorists. “Mutant-flu paper published: Controversial study shows how dangerous forms of avian influenza could evolve in the wild,” Nature News noted in announcing the publication of the article by a team led by Yoshihiro Kawaoka of the University of Wisconsin-Madison. The study showed that a mutant-flu virus could spread easily between mammals, leading researchers to fear that a strain could evolve in the wild and lead to a human pandemic. “This study has significant public health benefits and contributes to our understanding of this important pathogen,” Kawaoka said at the time. 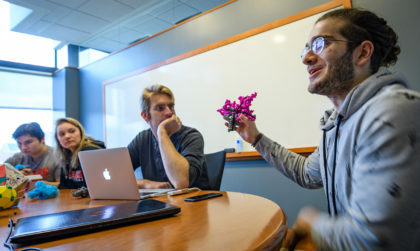 It’s real-world topics like these that undergraduate and graduate students tackle in the Clark University biology class Viruses: Friends or Foes. They discuss, debate, and explore the impact of viruses on the planet. But their professor, Nathan Ahlgren, also includes an additional assignment to help them better understand the molecular structures of viruses — a subject that’s not always easy for students to grasp. Ahlgren studies viruses as part of his research in marine microbial ecology. 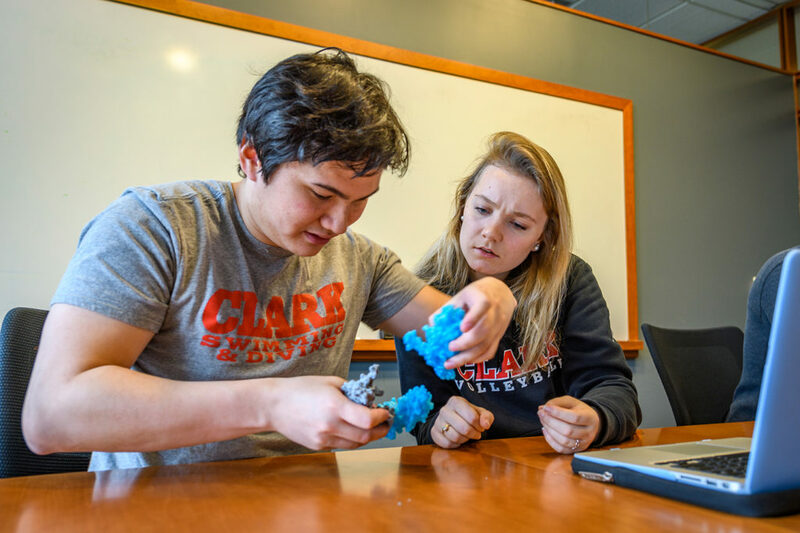 Taking a cue from current research on virus self-assembly and how-to YouTube videos, he thought his class might benefit from creating realistic 3D printed models of viral protein structures called capsids. A capsid is the protein shell that encapsulates the genetic material of the virus that infects cells. Zaza Gelashvili, right, demonstrates how to fit together pieces of a 3D-printed capsid. He was working on the models with, from left, Samuel Brody, Justine Bohl, and Professor Nathan Ahlgren. Recently, Ahlgren and three biochemistry and molecular biology seniors who are taking the course as part of Clark’s Accelerated B.A./Master’s Program — Justine Bohl of Amherst, Mass. ; Samuel Brody of Lexington, Mass. ; and Zaza Gelashvili of Tbilisi, Georgia — demonstrated how to assemble the protein structures. They used several colorful pieces hot off the 3D printer in the new Clark Makers Club, housed in the Physics Department. Each focused on a different virus: a human bocavirus that causes fifth disease (“slapped cheek” syndrome) in children; porcine parvovirus, which can lead to infertility in pigs; beak and feather disease virus, which can kill parrots and other birds; and satellite tobacco necrosis virus, which has been found to survive in water, highlighting a risk to plants grown in hydroponics systems. Each 3D piece represents a subunit of protein; when assembled, these proteins make a capsid. “We’re seeing how they fit together, like a puzzle,” Ahlgren explains. These virus capsids form a 20-sided shape called an icosahedron, so building the protein shell in 3D helps students better understand the symmetry and interactions between the parts, he says. Eventually, Ahlgren hopes his students might build a puzzle, fitting the pieces together with magnets, for museums to use in teaching schoolchildren about viruses. The next Rubik’s Cube, perhaps? All in the name of science.